First, thank you to everyone who clicked over to watch my new The Magic Detective Show on Youtube! I really appreciate it. Episode 1 showed an escape gone wrong. The escape in question happened in Venezuela some time around the mid 1970s and featured escape artist Steve Baker. Many of my younger readers and viewers may not be familiar with Steve, but from the late 1960s to the 1980s he was easily one of the most recognized and popular escape artists around. I can remember seeing him on TV all the time when I was a kid. The escape that is featured on the video is called 'Trial By Fire'. 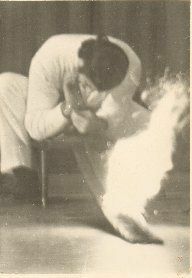 It just so happens that another escape artist, Norman Bigelow, also has an escape that he presents called 'Trial By Fire' but though they share the same name, the escapes are very different. In Steve's version he is chained to a wooden post and surrounded by a canvas covered t-pee like structure. The t-pee is sprayed with a special flammable chemical and then set on fire. Steve has seconds to get out the chains and burst through the t-pee flames before he too is engulfed in the inferno. He had presented the escape successfully before. But on this night in Caracas something went wrong! At this point I encourage you to watch the video if you already haven't. It's worth seeing, plus I explain what went wrong. Now the good news, Steve still escaped. The bad news was he suffered from some pretty bad burns. There was also more bad news. He still had another escape to do. He was supposed to escape from a packing crate in front of a live audience. His hands were bandaged up, but he still submitted to the challenge and escaped! But it was such a struggle that his hands began to bleed and by the time he got out of the trunk, his bandages were soaked red with blood! 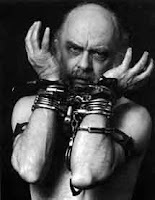 Also on the bill with Steve was another escape artist, The Amazing Randi. James Randi was another well known escape artist of the time, but he was slowly phasing out escapes and moving into the world of exposing fake psychics. His career as an investigator of fake psychics still goes on today. However, during his time in Venezuela, he too was there to present escapes. His first escape was from a locked safe on live TV, which is something he had done a number of times in his career. His second escape had him escaping from a straight jacket, but not in the normal way. They decided to hang Randi upside down from a helicopter and fly him all over the city dangling by his ankles! By all accounts it was quite thrilling. If I'm not mistaken there is an audio recording that Randi did in the late 70s or early 80s that was put out by Martin Breese and I believe that he mentions his time in Caracas with Steve, and I know he also mentions an escape of his that almost went wrong involving a locked safe. Now, just to keep the record straight, I mentioned Norman Bigelow and his escape also called 'Trial By Fire'. I do not know who created the name first. I have a feeling it was a name they both chose without knowing of the others creation. Bigelow was another of the big escape names in the 1970s. 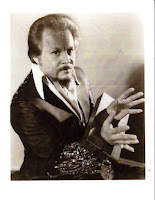 He was performing in colleges and went on to become a prolific writer on escapes and magic. One of his tomes had to do with the Death of Houdini and he put forth the theory that Houdini was indeed killed. I believe the name of the manuscript was 'Death Blow'. Lots of people talk about that possibility today, but it was Norm who really looked into it and developed the theory. Norman Bigelow continues to delve into little know areas of Houdini's life even today. Though his views are sometimes controversial, he doesn't do these things to become popular but to expose the truths he thinks are still hidden in Houdini's life and truths he believes we all should know. Now, as to Norm's version of 'Trial By Fire'. He would be handcuffed to a board. Running along the board is a trail of gunpowder which was set on fire. Underneath his hand is a large amount of gunpowder. He had only seconds to get out of the handcuffs before being badly burned. His escape was done out in the open with the audience watching him as he openly picked the handcuffs. A very original and very unique escape and presentation. 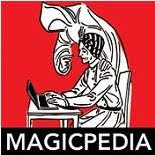 Speaking of original, his manuscripts are filled with ideas and concepts for escape artists and magicians. 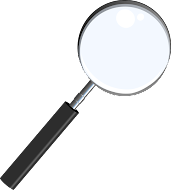 One of his ideas was used by David Copperfield in the 1980s and then featured on one of his Television Specials. In the future I think I'll continue to add some additional bits of information about the various episodes because afterall, they are only 5 minutes long. Eventually, once the audience is built up, I'll move to a longer format. See you all on FRIDAY for another episode of The Magic Detective Show! Great story, and fantastic information, Dean!